Wild rabbits may create problems for homeowners by damaging landscaping, ornamental plants, crops and gardens. There are a variety of measures though that homeowners can easily take to protect their property from further damage. Answer: Because you are within city limits your best alternative will be to put up some type of exclusionary fencings to prevent further damage. Associate Wildlife Biologist Randy Botta suggests that a fence of two-foot high chicken wire with the bottom buried a few inches in the soil should be sufficient to exclude rabbits from an area. Mesh size should be one inch or smaller. To protect trees or landscape plants, construct a barrier around the plants in the form of a cylinder made of plastic tubing or 1/4 inch wire hardware cloth that extends higher than a rabbit’s reach and stands far enough away from the trunk such that rabbits cannot eat through the mesh. Mesh size from 1/2 to 3/4 inch can be used but hardware cloth will best guarantee protection. Taste and odor repellents may also be used but are most effective when dealing with small numbers of rabbits and at the first sign of damage. These repellents usually have to be reapplied at regular intervals, especially following rains. In some cases, habitat manipulation to remove their living and hiding places may be effective but this may require official approvals and authorization from your association. 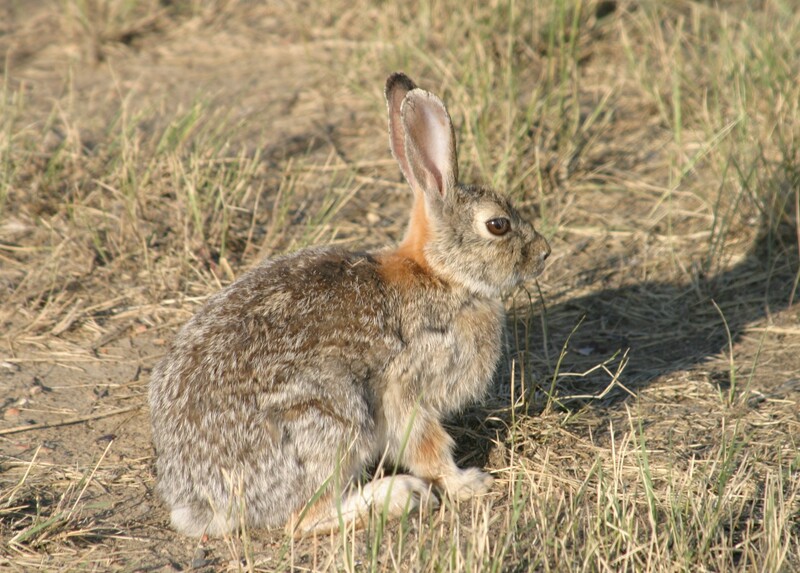 If you or your association decides all of these passive persuasions are not enough and more drastic measures are needed, a ruling by the Attorney General in 2006 now authorizes that cottontails and brush rabbits may be killed at any time if they are found to be damaging landscaping, ornamental plants, crops and/or gardens (FGC Section 4186.) In Orange County, you have the authorization to use box traps in addition to the other methods of take authorized by the regulations (CCR T14 section 311). Box traps have been used successfully to capture cottontails, or you may want to hire an authorized trapper to catch and remove the animals. Firearms and other methods of take may be used only where local ordinances allow, so check with local authorities first before attempting to do so. And finally, even if all of these methods fail, you still cannot take them by spear. According to Lieutenant Dennis McKiver, because the regulation says “no person may possess … within 100 yards,” it would be unlawful to even stand on the beach with a spear in hand if you are within 100 yards of the mouth of a stream. This means that you will need to find an entry point more than 100 yards away from the mouth of the stream to enter the water to go spear fishing. Answer: Abalone irons must be less than 36 inches long, straight or with a curve having a radius of not less than 18 inches, and must not be less than 3/4 inch wide nor less than 1/16 inch thick. All edges must be rounded and free of sharp edges (FGC Section 29.15[e]). Answer: If you still have the carbon copy receipt from your original, take it to a DFG license agent office, and for a replacement fee of $9.20, you can get a new license. Any stamps on your original license must be purchased again at the full price. If you no longer have proof of your original license purchase (carbon copy receipt or a clear photocopy of your original license), you will need to purchase new licenses at full cost. This entry was posted in Abalone, Depredation, Licensing/Permits/Stamps/Report Cards, Nuisance Animals & Pests, Regulations, Spear Fishing and tagged abalone, fishing, nuisance wildlife, regulations. Bookmark the permalink.